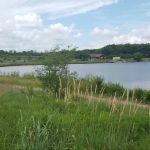 Ask fellow campers about "Camp Bullfrog Lake" and nearby attractions. Nightly rate reflects weekend, non-Cook County resident fee. Very nice park with adequate campsites. Nice views of lake. Shower/restrooms were clean and usable. Only problem was the well water at the campground. Since there are no water connections at the sites, you had to fill the camper water tank. They claim the water is not drinkable, so we brought good water in containers. What we discovered is the well water contains iron, which makes it look rust colored. They were working on a water purification system while we were there. Overall, we enjoyed that campground as a base for exploring Chicago. There were transit stations nearby to get into the city. 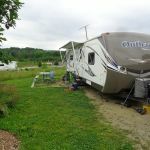 We camped at Camp Bullfrog Lake in a Travel Trailer. Had a nice site overlooking the lake. The MAIN reason we stayed here was its proximity to Chicago. 1/2 hour to 45 minutes depending on traffic. Great to be able to set up shop that close to the city. We camped at Camp Bullfrog Lake in a Motorhome. 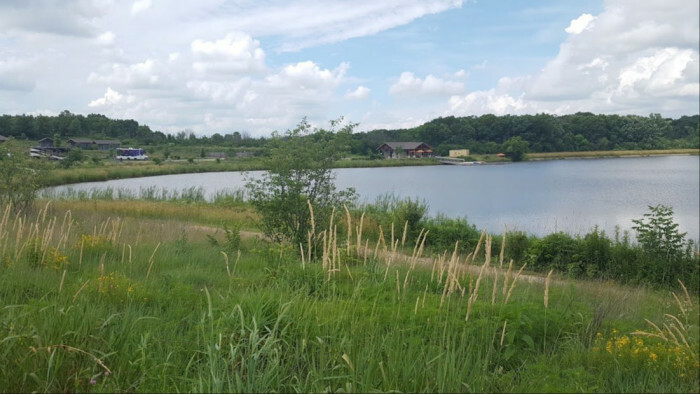 Lakeside tent and RV sites in forest near Chicago. Beautiful, quiet setting. Narrow paved roads and, narrow, level gravel sites, but back-in access was acceptable (most sites have gravel turning apron). Park is new, with lots of grass and young trees. Lots of dog walking area around lake. There are fire rings and picnic tables at each site. Restrooms are clean, but showers are not (women's side had dirt under bench and mulitple day hair buildup on the floor. Also, well water has caused brown rust stains on everything, so it looks unappealing, and water has a very unpleasant mineral odor and taste. A sign claims they are intending to install a filtration system. RV sites have 50/30/20 electric, but no water. There is one spigot at the office, but it is connected to a garden hose and I would not put that water in my tank anyway, so bring your tank full from outside. There are variable length sites, so choose carefully. There is room at front of RV sites to diagonally park a vehicle. No at-site sewer, but there is a dump station. Very over priced based on lack of at-site sewer and water issues. This place would be an 8 if it had at-site, decent water. We would not stay again unless they improve the water quality. 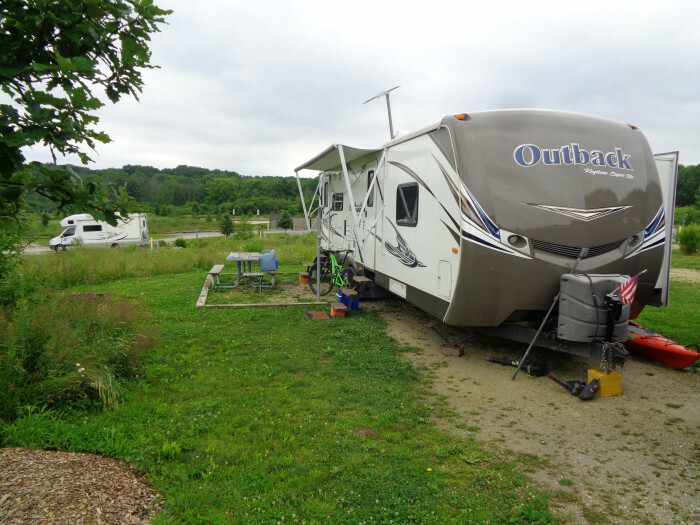 We camped at Camp Bullfrog Lake in a Fifth Wheel. Are you affiliated with Camp Bullfrog Lake ?